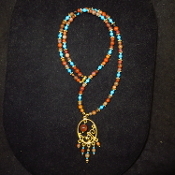 This is a gold colored AZ Petrified Wood and Turquoise beaded dangle necklace. It is about 18 inches long. 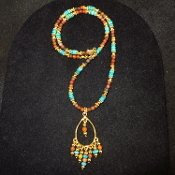 Each piece will vary slightly from photo. This item ships free anywhere in the continental USA. 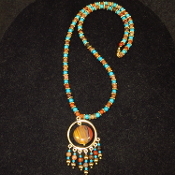 This is a gold colored AZ Petrified Wood and Turquoise beaded dangle pendant. 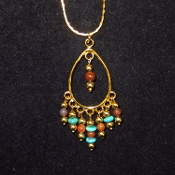 It comes on an 18 inch gold colored chain. 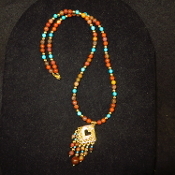 Each piece will vary slightly from photo. This item ships free anywhere in the continental USA.